"Move over, apple sauce. 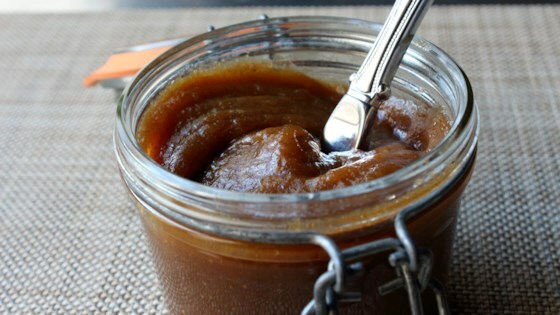 Apple butter is basically a spreadable apple pie filling, only better. Though cooking time is long, it's super easy and pretty hands-free. Pair it with some sharp Cheddar on a cheese plate, or slather it onto cheesy biscuits (see footnote). Other approved uses include spreading between the layers of a spice cake, filling seasonably appropriate thumbprint cookies, or even as a condiment for pork chops." Place apple pieces into a large slow cooker. Add white sugar, brown sugar, salt, cinnamon, nutmeg, allspice, and vinegar. Add a splash of water and mix well. Cover and cook on High until apples are starting to soften and release liquid, 1 to 2 hours. Reduce heat to Low and cook, uncovered, until all the apple flesh is dissolved, 5 to 6 hours. Stir occasionally. Puree using an immersion blender until smooth. Continue cooking, stirring occasionally, until darkened and thick, about 4 hours more. Pass apple butter through a strainer if desired. Seal in a glass container and refrigerate until cool. Any classic cooking apple should work in this recipe. If you don't have a slow cooker you can certainly do it on top of the stove over low heat, as long as you use a nice thick-bottomed pot, and stir often. Another option would be to place the mixture in a large roasting pan, and cook it in a slow oven, stirring occasionally until dark and thick. See my recipe for Irish Cheddar Spring Onion Biscuits. It was well worth the wait & time. Thank you Chef John. Made it twice so far. Only diff was using more apples the second time. My house was filled with the scent of apples, and spice lovely! Truly a pleasure to make, stir and create Christmas canned presents! Excellent and well worth the time. I need to reduce amount of apples since I have a small slow cooker. Mine will only take 1-1 !/2 pounds of apples.